The South's mecca for cast iron, South Pittsburg, Tenn., will celebrate its 12th Annual National Cornbread Festival April 26-27. South Pittsburg, home to Lodge cast iron, is about 2.5 hours northeast of Anniston and an easy drive for the festival. The event features, naturally, cornbread, music, Southern food and a host of cook-offs and celebrity chef appearances. Several years ago, to mark the annual festival, The Star hosted a cornbread cookoff. 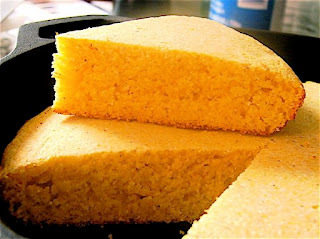 Lula Ponder of Weaver turned in a recipe for Jalapeno Cornbread that still gets rave reviews anytime I make it. If you can't get coarse (water-ground, or heirloom, as fancy folks put it) corn meal locally, then Anson Mills produces heirloom grains and meals. Preheat the oven to 425 and get your skillet hot (along with 1 tablespoon of oil) by putting it in the oven while you mix your batter. Combine the dry ingredients; add the onion, cheese, jalapeno. Mix well, then add remaining ingredients, using enough buttermilk to get a good pouring consistency. Put in hot skillet.